We are officially upon BBQ season and you don’t want to bring just any old side dish to a party, right? RIGHT! We’re talking Memorial Day, 4th of July and more. If you’re like me, well then your dance card for all these BBQ’s is filling up quickly and you’re starting to panic on what to bring. Never fear – Jen is here! 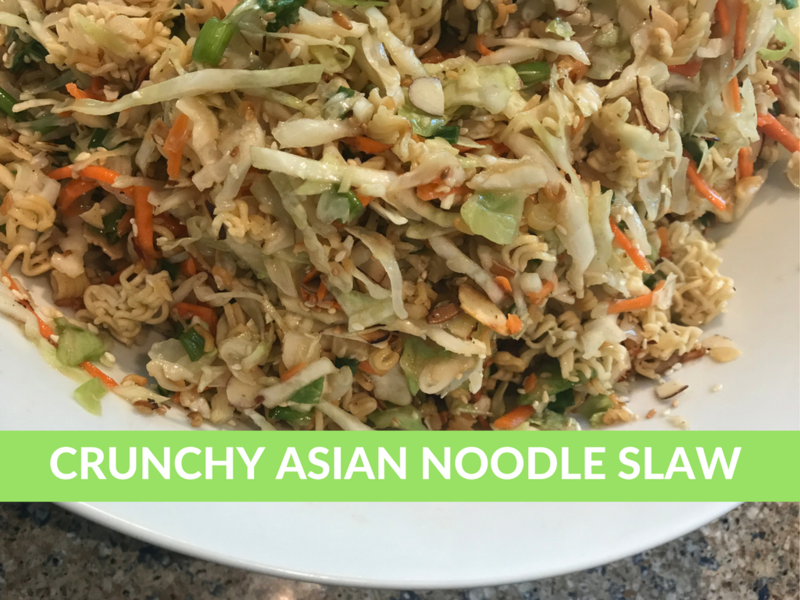 I’m here today to share with you one of my favorite salad dishes around Crunchy Asian Noodle Slaw. The secret to this dish is you have to eat it VERY quickly. Failure to do so will result on soggy noodles and who wants that? I’m not talking speed eating here, but this isn’t one of those recipes you keep for leftovers. Around our area bringing dishes to parties and BBQ’s can get fairly competitive and I can guarantee this will be a showstopper. I actually made this for a baby shower yesterday by request and it was a hit. I felt like Ree Drummond with her big portion sizes but it worked. I’m here today to show you how to make this dish for a crowd and you can even make ahead a little so you’re not all stressed out before a party. My kind of dish, right? It has the perfect sweet, salty and crunch you’re looking for with a dish. 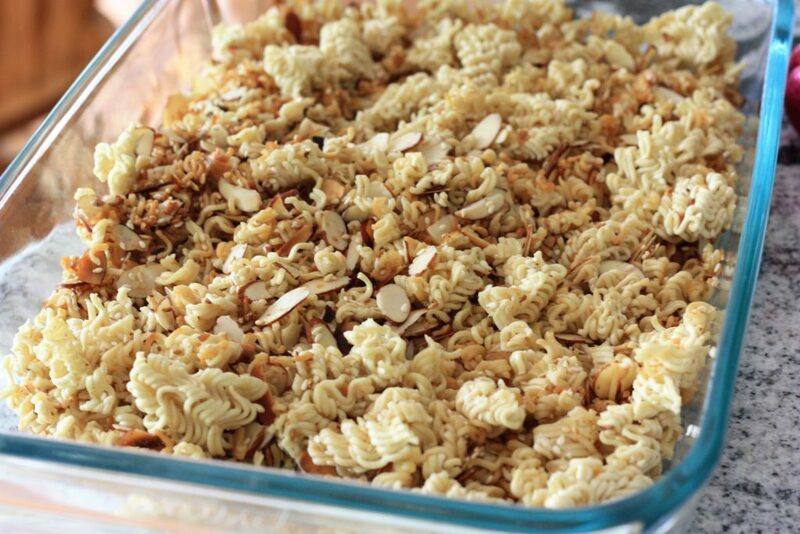 In a saute pan, melt butter and add packages of chunkily crushed Ramen Noodles, Almonds and Sesame Seeds till lightly toasted. Set the flavor packets to the side – approx 5 mins. Remove from pan and let cool on baking sheet. At this point you could store for later or set aside for use. Combine sugar, oil, soy sauce, sesame oil, apple cider vinegar and 2 packets of the Ramen flavor packets in a mason jar. Shake well. If you’are waiting, go ahead and toss this in the fridge. About 1 hour before you are going to eat, add the Cole Slaw Mix to a large bowl. Add about half of the dressing and coat. Put in the fridge for 1 hour. This till give the cabbage a little time to break down and get some of the flavor. Right before serving, check the dressing levels, add more if necessary and add the crunchy toppings and combine and serve. And there you have it. A fool proof easy party pleaser for the summer! I also love it because there it’s perfect for hot parties because nothing will spoil. Now this recipe serves a lot. The great thing is your can adapt the recipe how you need it. 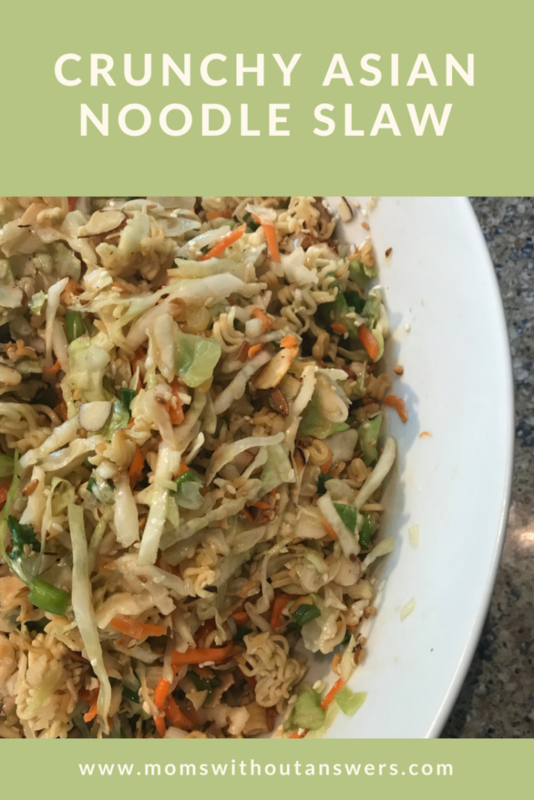 Most parties can use 2 bags of slaw and then use the dressing you need. 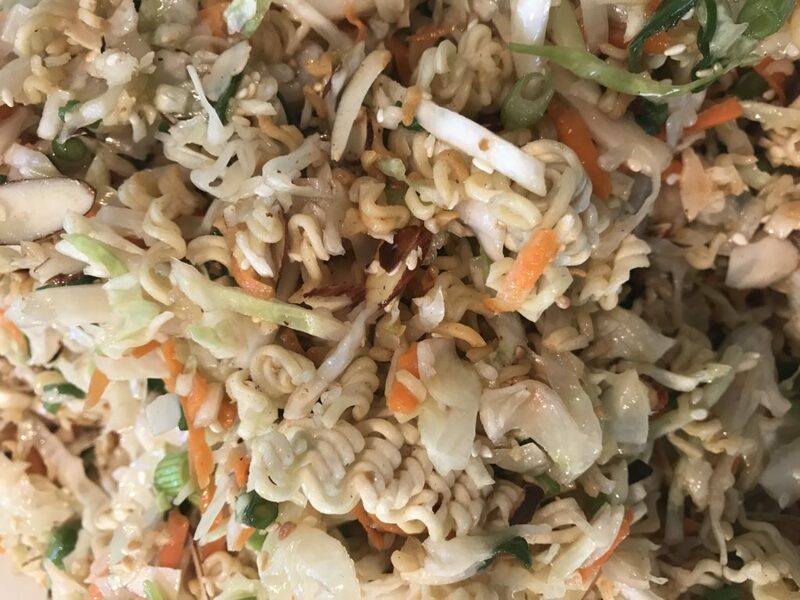 In my opinion, you can’t over noodle this salad and to be perfectly honest, because I have to, I eat a lot of crunchy buttery ramen while I’m making it. It’s so good! I’ve been known to add an extra pack of noodles just for snacking. Tell me about your summer plans that you’ll need to bring a dish! 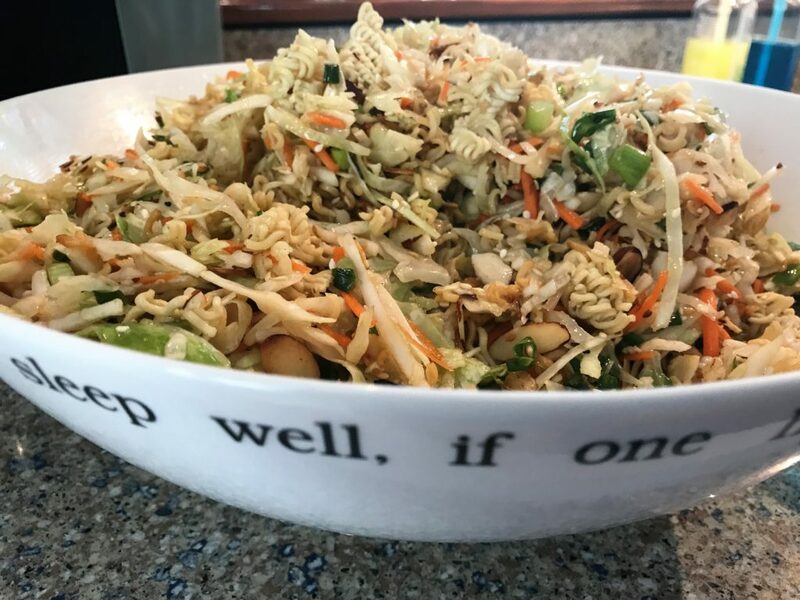 Where would you take your Crunchy Asian Salad?